L does Nails...yes I do! In case you weren't already aware (admittedly, I didn't make a public announcement or anything), I recently began freelancing as a sessional nail technician...under the name of L does Nails . When I first started out in the world of nails, it was via this blog which was born three years ago. Back then I was on maternity leave with my second child and it felt like I had all the time in the world, believe it or not. After returning to part-time work, I decided to get a nail qualification so that I could possibly run a mobile nail business as a side line. Unfortunately, the whole idea of being mobile didn't fit into my daily schedule, especially after I returned to working more hours per week and after doing a full day in the office, I'd be too tired to want to get back on the road to do nails. By chance, I got an email from another freelance manicurist who needed my assistance. It was then that I was introduced to 'event nail art'. I've steadily been booked for work doing complimentary manicures on nail bars for press events, product launches and more recently, festivals. Even though my plans to be mobile didn't quite work out how I'd initially wanted them to, other doors have been opened for me and I'm really quite grateful that I've had such fortune. At this point, I'm insured, qualified, registered, trade and already up and running. If I could do this sort of thing full-time I would, but right now it's not feasible. Oh well, who knows what the future holds, eh? I love this so much - Rhonda created it after seeing my ideas in a make-shift drawing I did on a sticky label at my office desk! At some point I will be trying to link my blog to my website, but that will happen in time. Please stop by and have a look at my site - let me know what you think? The event was a lot of fun. I got to ask some pertinent questions about the nail industry, met someone who I have a lot of professional respect for and also got a few cocktails at the end! The next Master Class will be a good one. Sophie Harris-Greenslade aka The Illustrated Nail will be there! I got to work with her recently (that's another story) and she's soooo nice. If you're in London (or somewhere in the UK and fancy the journey) will YOU be going to the next class? This is a short post on-the-go today. I was at the Farr Festival this weekend, with a group of other amazing manicurists. We were providing manicures with nail art for the festival go-ers. Unfortunately, as usual, I got carried away and forgot to take pictures! I did have a few guys asking for 'Farr' and 'Fest' on their thumbs...I'm glad they got involved! 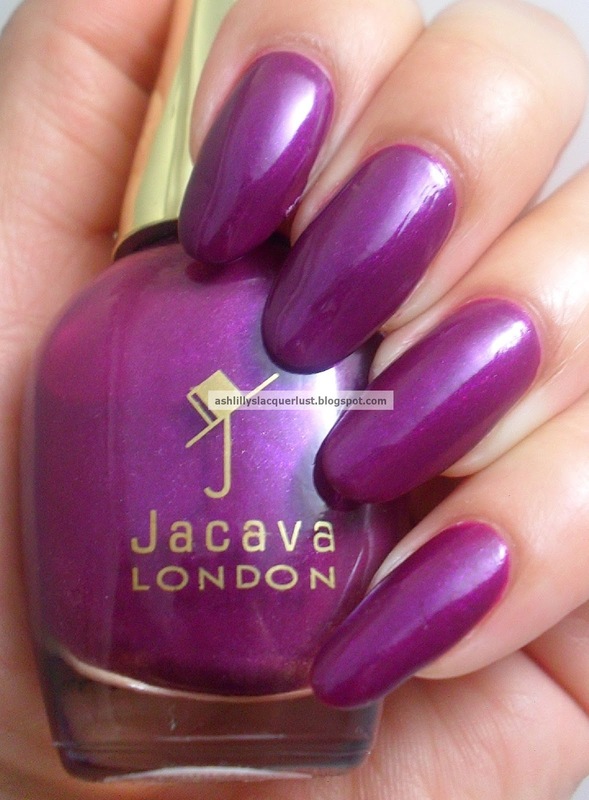 Tonight I have some Jacava swatches for you. 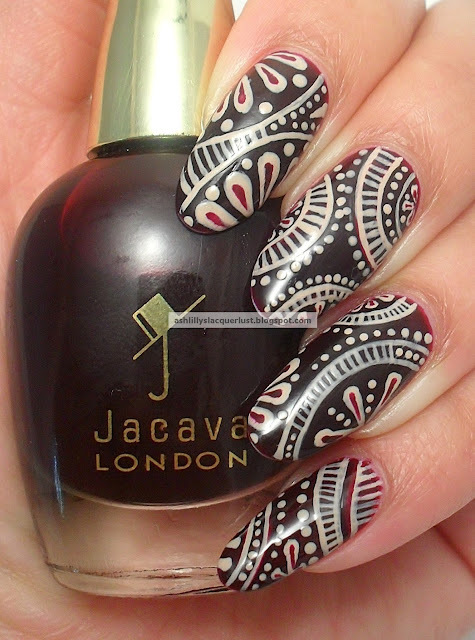 This is 'Damson Delight' - a dark red jelly polish...to which I added a few hand painted designs. 'Marrakesh Nights' - this is a purple with a pink and blue shimmer. Last, but not least - 'Passion'. Personally, I think Damson Delight is my favourite out of the three although the other two are beautiful colours too. The formula is smooth and does not streak when applied. Have you tried any Jacava polishes?